Research takes Earth scientists to the four corners of globe. So, if you happen to have a keen interest in photography and find yourself doing research at high latitudes, chances are you’ll get lucky and photograph the dancing night lights: aurora (or northern lights), arguably one of the planet’s most breath taking natural phenomenon. That is exactly the position Matias Takala, a researcher at the Finnish Meteorological Institute (FMI), was in when he was able to take this incredible photograph of the swirling aurora and a single beam of green penetrating the Finnish night sky. The green beam is emitted by Lidar (the Mobile Aerosol Raman Lidar, MARL, to be more precise). This lidar system is designed to measure tropospheric and stratospheric aerosol profiles (backscatter, size distribution, mass), tropospheric water vapour and clouds, with the ability to distinguish between particulates such as dust, ash, and smoke from biomass burning. The system is based at the Arctic Research Centre (ARC) at Sodankylä. Because environmental change is most pronounced in the Polar Regions, the location is ideal to study the effects of a warming climate as a result of environmental changes brought about by the activities of humans. The high latitude position of the research station means it is also ideally located to contribute to the continuous monitoring of ionospheric activity. Think of the ionosphere as a ring, 85 km to 600 km above the Earth’s surface, of electrons, electrically charged atoms and molecules that surround the Planet. It is here that aurora are generated as incoming charged particles from solar wind collide with the electrons and atoms of gas in the ionosphere. 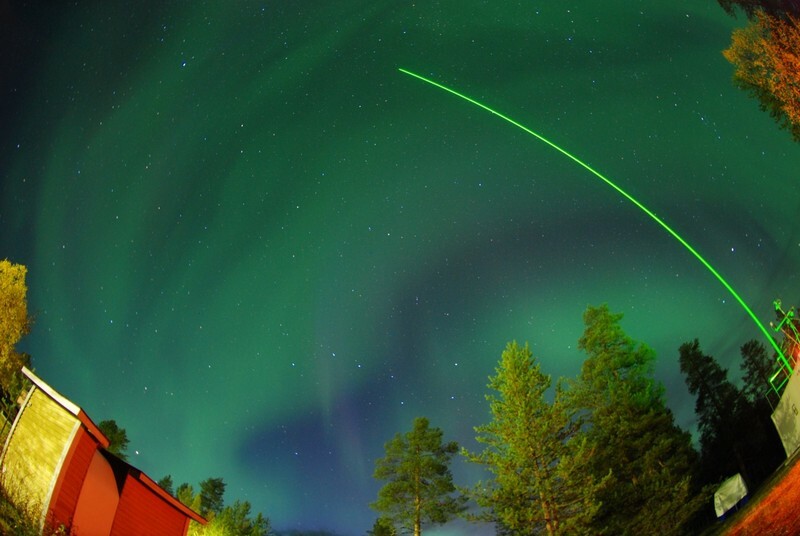 A network of FMI auroral cameras and magnetometers continually survey the sky to provide space weather services, including alerts for when the best auroral displays are likely.